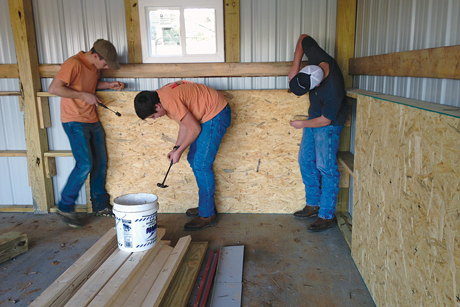 Holston High School students played an important role in finishing the inside of the barn that was built using the grant funds. Once the structure was up, they constructed walls and sides to keep the animals safe. Agriculture is an evolving industry that is becoming more scientific and technical. These changes mean exciting new career opportunities, but students must be equipped with the skills and knowledge to meet employers’ ever-changing needs. In an effort to help teachers prepare students for these jobs, Virginia Tech has provided six Virginia high school programs with Virginia Agricultural Education Centers of Innovation grants. This funding is made possible through the Virginia Department of Agriculture and Consumer Services with matching funds from the Virginia Tech Foundation Fund for Community Viability. “We are excited to work with agriculture teachers who are pushing traditional boundaries to broaden students’ education and career opportunities,” said Donna Westfall-Rudd, associate professor of agricultural, leadership, and community education and project leader for Virginia Agricultural Education Centers of Innovation. Teachers were asked to develop proposals that detailed curriculum and activities that supported contemporary agricultural education through the use of new classroom and laboratory technology. The goal of the innovative curriculum was to improve students’ career and college readiness. In Washington County, Holston High School agriculture teacher Sarah Scyphers used her grant to build a barn to house animals near the school. Scyphers is excited about the learning possibilities associated with keeping the animals on-site. “Instead of playing games and just identifying things, the students can now put their hands on the animals,” she said. Having the animals at the school will allow Scyphers and Phil Blevins, the Virginia Cooperative Extension agriculture and natural resources agent in Washington County, to conduct Beef Quality Assurance training for the students during the school day. John Carpenter, the middle school agriculture teacher in Carroll County, has worked with Handibot, a smart power tool company, to develop a compact, computerized, numerical-control milling machine that is ideal for school systems as well as affordable. Carpenter’s students are using drafting software to develop programming skills while learning an appreciation for one of our country’s leading natural resources — timber. Halifax County agriculture students made art-inspired garden decor and tools. These items will be sold in an online store created by the students and their high school teacher, Jon Chandler, as an entrepreneurial experience. The students built the online store while learning horticulture and developing business skills. Lessons created for these and the other programs are available to teachers through the Virginia Agricultural Education Centers of Innovation website. Grant recipients have also shared their experiences at the Early Career Teachers conference and the National Association of Agriculture Educators convention. Community resources and expertise were extremely valuable to teachers developing innovative programs. Each teacher formed an advisory committee made up of community leaders, local industry representatives, parents, and school board members. These committees provided guidance for curriculum development and assistance during implementation of the programs. This support ensured that students received relevant skill development to prepare them for college or future careers. 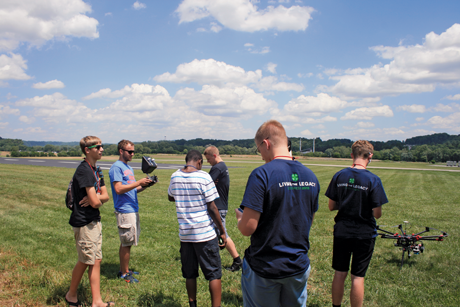 During the Drones and Other Unmanned Aerial Vehicles workshop, participants view a demonstration of drone technology. After 95 years, Virginia’s State 4-H Congress remains the premier 4-H event, drawing more than 450 young adults from across the commonwealth to the campus of Virginia Tech for four days of learning, leadership, and fun. “4-H Congress provides members an opportunity to develop life skills and hone their leadership abilities while forging new friendships,” said Tonya Price, an Extension 4-H youth development specialist. This year’s theme — Living the Legacy – 4-H Forever — drew upon the history of 4-H and its power to assist teens in developing leadership, citizenship, and life skills through hands-on educational programs. During congress, delegates have the opportunity to compete in events like food challenges and extemporaneous speaking contests. They can also attend workshops to learn more about 4-H competitions like the electric challenge or cattle working. And while at congress, delegates participate in a service-learning project. Workshops led by Virginia Tech faculty members allow teens to explore career paths in animal science, STEM, leadership, citizenship, healthy living, and environmental science. Sessions offered included Drones and Other Unmanned Aerial Vehicles, National Weather Station Tour and SKYWARN Training, So What’s It Like To Be a USDA Veterinarian?, and Fashion Merchandizing, to name a few. Congress delegates also learn about educational opportunities at Virginia Tech and Virginia State University. They visit with college representatives to learn about career paths they could pursue. 4-H Congress Coordinator Sam Fisher said that during the college/career tracks, 4-H’ers learn what college truly can offer them. “They discover things about colleges and majors that they didn’t even know existed,” Fisher said. Delegates, who submitted applications and were selected, interviewed to represent Virginia 4-H at National 4-H Congress in Atlanta. As part of the process, youth present portfolios of their 4-H experience. The 21 delegates selected this year have an opportunity to interact with and learn from other outstanding 4-H members from across the country. The Virginia 4-H Cabinet is elected during state congress. Cabinet members plan events like 4-H State Congress, and they work to enhance the public’s understanding of 4-H.
Abby Durheim, from Stafford County, was elected to the cabinet representing the Northern District this year. Durheim, who has been in 4-H for seven years, is considering a career in agricultural law or political science. She wants to further involve herself in 4-H, carrying on the family tradition — her parents were also 4-H’ers. 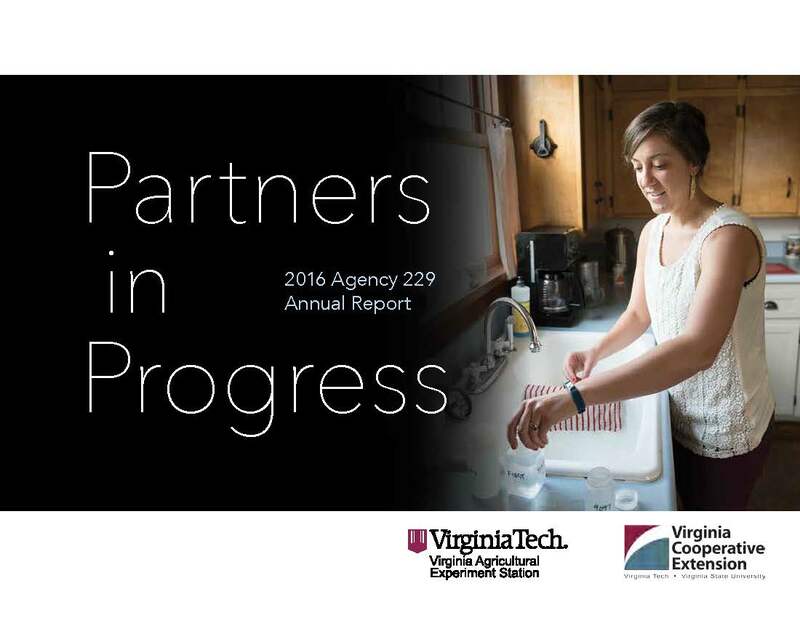 For more information about the report, contact vceeditor@vt.edu.